Yesterday we received a diamond from our International Selection that had an inscription that I had never seen in real life before. Anyway, the inscription, as shown below means that this particular diamond is a Hearts on Fire (HOF) branded diamond. I can only guess that we came across this stone because of the recent squeeze in the US of HOF retailers. With many retailers having “dead stock” it is likely that at least a few of them sought to sell them through the wholesale market. 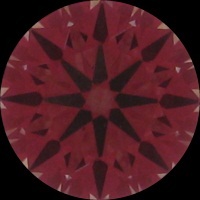 Anyway, this particular stone was re-certified by the GIA, as HOF are certified by the AGS. What caught my eye was that GIA had given a polish grade of only Very Good not the top grade of Excellent. I knew that AGS is a bit soft on polish. I even sent a few more stones that had a GIA Very Good polish grade to AGS last year and obtained their Ideal grade. Perhaps because they have a clarity grade of “0” which covers both Flawless and Internally Flawless on the GIA scale, they examine the diamond’s surface differently from GIA? Anyway, one of HOF’s main selling points is that they cut and polish their diamonds with a 100x lens. Now I’ve never used a 100x lens before (our microscope only goes up to 90x), but I would imagine that if the diamond was really cut with a 100x lens, then they would be able to see polish marks that the GIA picked up with a 10x lens. 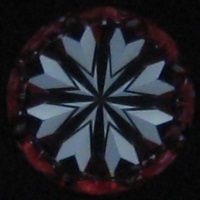 In any case, the diamond was very well cut, and the Ideal-Scope and hearts pictures are below. One last thing that I found strange was that GIA mis-spelt Hearts on Fire and left out the E in the Hearts. This unfortunately is nothing new, as we have had instances of GIA’s administration printing the wrong certificate type and not laser inscribing the diamond. This entry was written by Nikhil Jogia and was posted on on Thursday, August 12th, 2010 at 3:48 pm	and is filed under Diamonds. You can follow any responses to this entry through the RSS 2.0 feed. You can leave a response, or trackback from your own site. Hmmmmm….I would like to point out that the actual inscription shown does say “HEARTSONFIRE 4024?”. The E is included, but the last number is difficult to read due to the angle. It’s the GIA that made the mistake on the certificate – not Hearts on Fire. As a matter of interest, the ideal scope and cut as you’ve pointed out for this HOF diamond is very well cut, would this greatly determine the price?